Alyssa Garcia swings at a pitch. Garcia scored a run in Butler’s win over the Hoosiers. Jimmy Lafakis/Collegian file photo. 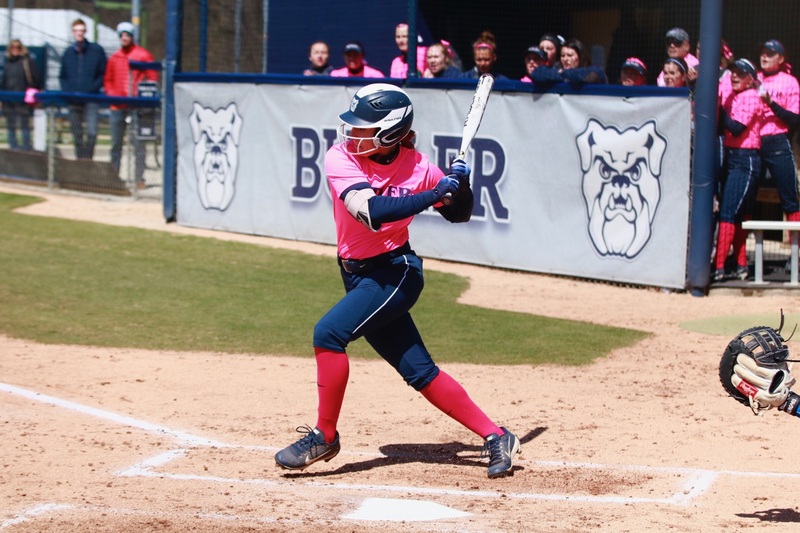 The Butler University softball team split a doubleheader at Indiana University on April 10. The Bulldogs are now 3-3 in Big East play and 13-20 on the season. In the first game, Indiana jumped out to an early 1-0 lead in the first inning before adding two runs in the second inning and four in the third. Butler, meanwhile, got on the board in the second inning on a solo home run by junior infielder/pitcher Kaitlin Doud, her fourth of the season. A Hoosiers’ throwing error in the seventh inning allowed sophomore outfielder Payton Longest to score the Bulldogs’ second run, but Indiana was able to hold on for a 7-2 victory. Doud made the start for Butler on the mound, surrendering five earned runs on seven hits over three innings. The right-hander took the loss, falling to 6-5 on the season. Sophomore Gabbi Schnaiter pitched the final three frames, holding Indiana scoreless while striking out six. The Bulldogs struck first in the second game of the day, scoring single runs in the first and second innings on an Indiana error and RBI single by freshman infielder Claire Gilliland. Sophomore infielder Christina Candotti added to Butler’s lead in the third inning with a two-run single. The Hoosiers got on the scoreboard with a solo home run in the bottom of the seventh inning, but were unable to complete the comeback, with Butler picking up the 4-1 victory. Freshman Alyssa Graves pitched six innings, giving up one run while striking out three and walking two. The left-hander lowered her team-leading season ERA to 1.67 with the outing. Schnaiter picked up the save with a clean seventh inning. The Bulldogs will travel to Washington, D.C., for a three-game series against Georgetown University on April 14 and 15. They’ll then return home for a matchup against Ball State on April 18.